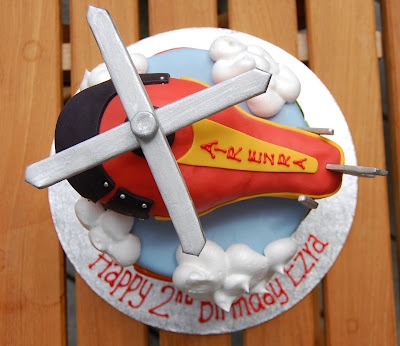 Having only recently taken my first helicopter ride in March, I was excited about this week's project, a birthday cake for Ezra, a two year old who has a love for aircraft. You may remember the cake I did for his sister, Simone. Although Ezra's mom is a supreme chocoholic, we decided to feature more summery flavours and ended up with vanilla cake, passionfruit mousseline, and fresh strawberries in a tall 6" round size. The helicopter was constructed from Rice Krispie treats which I carved and covered with fondant. Since a helicopter can not be a helicopter without a spinning propeller, a manually functioning propeller was fashioned with the help of one toothpick. Ezra just went on a big camping trip so I decided to set the flying helicopter against a fondant landscape of mountains, trees, and lake. Puffy Italian meringue clouds completed the scene. 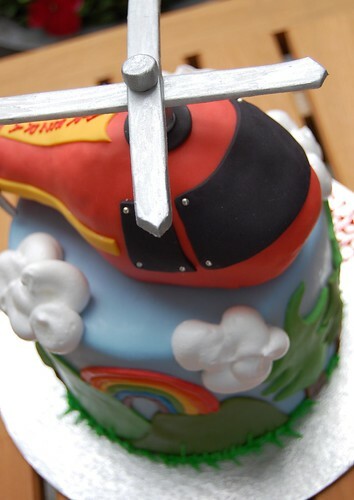 As anticipated, the children poked the clouds before the cake was even served and the propeller eventually broke from overspinning, but the cake was succesfully devoured, so I am told. Happy Birthday Ezra! Posted by Charmaine at 12:33 p.m.
that came out awesome, can you post pics. of how you did it by any chance? thank you! July 16, 2009 at 5:19 a.m.
Wen: I never post my email address because I get too much spam! Please leave another comment including your email address (I won't publish the comment) and I will write you back about NWCAV. Paula: Sorry, I don't usually bother taking photos of the process since I'm usually too busy and my kitchen does not have the best lighting! I do everything freehand and often without much planning. Good luck! July 16, 2009 at 8:14 a.m.
July 16, 2009 at 12:40 p.m.
July 17, 2009 at 7:08 a.m. So beautifully done! 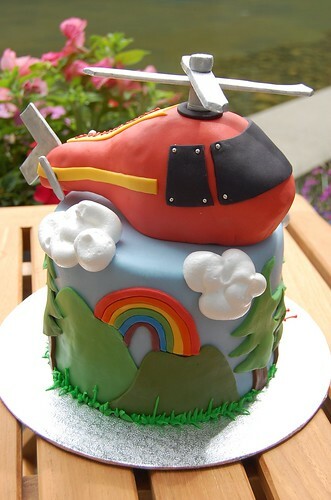 I was watching them bake a helicopter cake on Ace of Cakes but I have to say that I like yours so much more. Just wonderful. July 17, 2009 at 2:01 p.m.
March 26, 2011 at 12:58 a.m.
Karley: Dried fondant, then painted with silver lustre dust mixed with vodka. March 26, 2011 at 4:22 a.m. 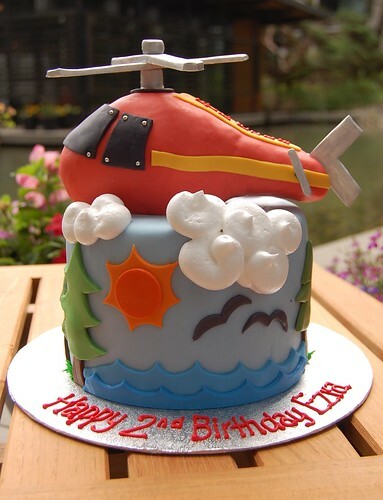 This is by far the best helicopter cake I've seen on the net, what a triumph, congratulations, I love it! My son (complete helicopter addict) will be 2 next month and I'm going to have a shot at re-creating your masterpiece (I really I hope I do it justice). Could you share your 'clouds' recipe? Pleeeeeese? October 20, 2012 at 3:05 a.m.